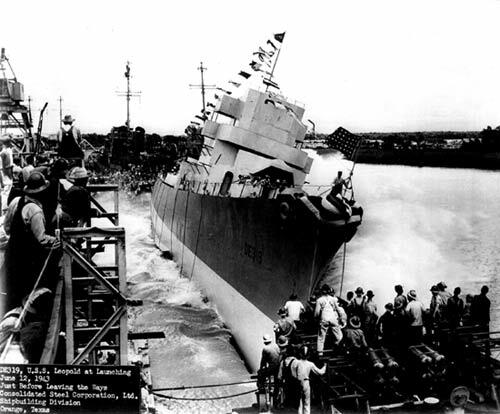 USS LEOPOLD (DE-319) LAUNCHING, AT ORANGE, TEXAS, 12 JUNE 1943." photographer unknown. Loss of 172 crew KIA through explosion on board by a acoustic torpedo. Only 28 survivors were picked up by the sister ship USS Joyce (DE 317). Sunk on 9 Mar 1944 by U-255 (Harms).